Agriculture at a Crossroads - Business as Usual is Not an Option! Why should 821 million people on our planet be going hungry while 1.9 billion are suffering from the ill effects of overweight and obesity? In 2017 more grain was harvested than ever before: 2.65 billion tons worldwide. Despite this record-breaking harvest, only 43% was used to feed people. The rest was used to feed livestock, fill our petrol tanks, support industrial production processes or was simply wasted. Our global food system is one of the most significant contributors to climate change, loss of biodiversity, pollution and water shortages as well as preventable disease, poverty and injustice. On behalf of the United Nations and the World Bank, in a four-year-process, more than 400 scientists summarised the state of global agriculture, its history and its future. The outcome was the International Assessment of Agricultural Knowledge, Science and Technology for Development (IAASTD). The findings are uncomfortable and alarming: providing a warning on the misleading ways of the past and showing new ways forward. This website makes the IAASTD’s findings available by topics, and offers all reports as well as updated figures, background information and news. Business as usual is not an option, if we want to reduce hunger and poverty, improve rural livelihoods and achieve environmentally, socially and economically sustainable development for all. This was the message of the “International Assessment of Agricultural Knowledge, Science and Technology for Development” (IAASTD). The new brochure “Agriculture at a Crossroads” presents the report’s main findings with updated facts and figures, charts and maps and the latest scientific insights. 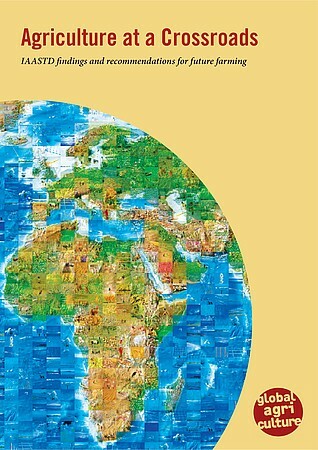 The 52-page-brochure covers topics such as hunger and health, meat and animal feed, industrial and small-scale farming, agroecology, climate and energy, soil fertility and land grabbing. It connects the IAASTD’s findings to the UN Sustainable Development Goals and contains an interview with IAASTD co-chair Hans Herren. 2/19: A group of leading food experts have mapped out a vision for reforming European food systems in a new report launched in February. EU food and farming systems require a fundamental change of direction in order to address climate change, halt biodiversity loss, curb obesity, and make farming viable for the next generation, says the International Panel of Experts on Sustainable Food Systems (IPES-Food). 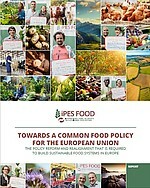 The expert panel proposes a “Common Food Policy”, a policy framework setting a direction for the whole food system, realigning the various sectoral policies that affect food production, processing, distribution, and consumption, and refocusing all actions on the transition to sustainability. Read more or download the report. 9/18: September 25th marked the third anniversary of the 2030 Agenda for Sustainable Development. In 2015, the 193 UN Member States adopted 17 Sustainable Development Goals (SDGs) and a set of 169 targets that aim to end poverty and hunger in all their forms by 2030 while protecting the environment. Eliminating hunger is a key issue of the new agenda. Goal 2 promises to „end hunger, achieve food security and improved nutrition and promote sustainable agriculture”. It has targets on ending hunger and malnutrition by 2030, doubling the agricultural productivity and incomes of small-scale farmers, ensuring sustainable food production systems and resilient agricultural practices, and maintaining the gentic diversity of seeds, plants and animals. 4/18: The way the world grows its food has to change radically to better serve the poor and hungry if we are to cope with a growing population and climate change while avoiding social breakdown and environmental collapse. 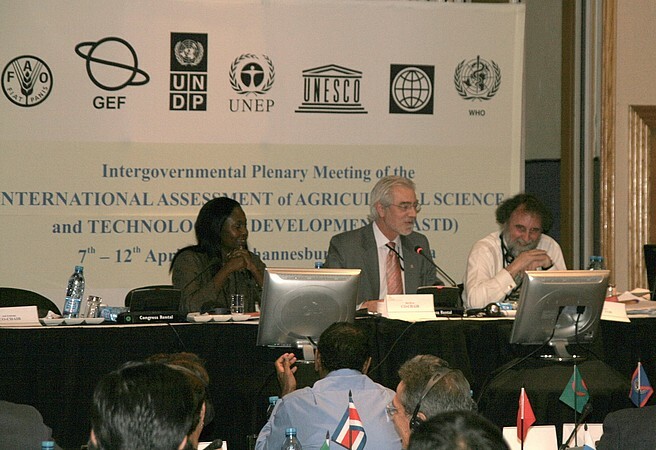 That was the message of the press release published on April 15th 2008, announcing the adoption of the International Assessment of Agricultural Science and Technology for Development (IAASTD). On behalf of the UN and the World Bank, more than 400 scientists had summarised the state of global agriculture, its history and its future in a four-year-process. You can read the main messages of the report here. 3/18: Biodiversity continues to decline in every region of the world, significantly reducing nature’s capacity to contribute to people’s well-being. This alarming trend endangers economies, livelihoods, food security and the quality of life of people everywhere, according to four landmark science reports written by more than 550 leading experts. The regional assessments, released by the Intergovernmental Science-Policy Platform on Biodiversity and Ecosystem Services (IPBES), cover almost the entire planet. In Europe and Central Asia, land-use change is the main driver. Production-based subsidies have led to an intensification in agriculture and forestry, accelerating biodiversity loss. Read the summaries for policy makers and find out more about a new report on land degradation also released by IPBES. 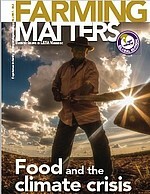 6/17: This last issue of Farming Matters addresses the intersection of agroecology, food sovereignty and the climate crisis. Climate change is a political problem that highlights the need for systemic change to the way food is produced, processed and distributed. From agroecological practices that build resilience, to social movements that resist land grabbing, the magazine articles not only argue for changes to the food system but demonstrate some possibilities. They involve challenging the corporate food system and putting agroecology and small scale farmers first again. Farming Matters presents how small scale farmers bear some of the biggest burdens brought about by the climate crisis, yet, the agroecology that many practice and the food sovereignty that many strive for provide a pathway to cool the planet and feed its people. Read more. 2000m²: Take a look at your share of gobal food and land! If we were to divide the total global surface area of arable land by the number of people living on the planet, each person would get 2000m². It is on this piece of land that everything Mother Earth supplies you with must grow: wheat, rice, potatoes, fruit, vegetables, oil, sugar… not to mention all the animal feed that does not stem from meadows and pastures. Visit the website of this project to find out what your 2000m² would look like if they were to represent the global situation and to get a sense of your own role in global agriculture. The original version of the full report, five regional reports and the Synthesis Report in English.